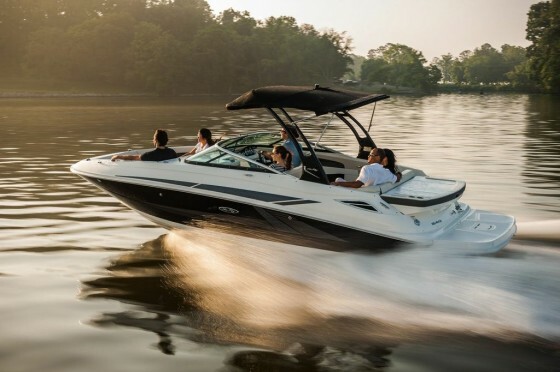 Gobs of room, zippy performance, plus smart construction and design details mean the new Sea Ray 240 Sundeck will appeal to a wide spectrum of deckboat lovers. 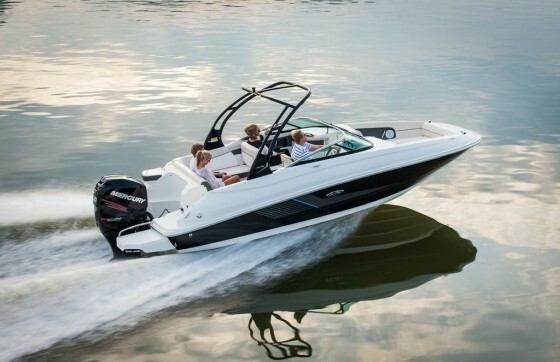 Sea Ray is on a red-hot streak: last fall the avant-garde 510 Sundancer hit the water, then they rocked the sport cruiser world with the outboard-inboard 370 Venture which won an NMMA Innovation Award, which was quickly followed by Sea Ray’s return to the jet boat market with the 21 Jet. These are all major-league developments—not mere model-line tweaks and beautification—and it’s continuing with Sea Ray’s new deck boat line-up, featuring the 240 Sundeck. 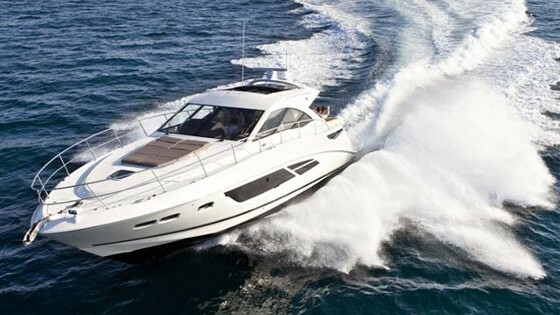 The biggest news about the Sea Ray 240 Sundeck is that it's available with outboard power. 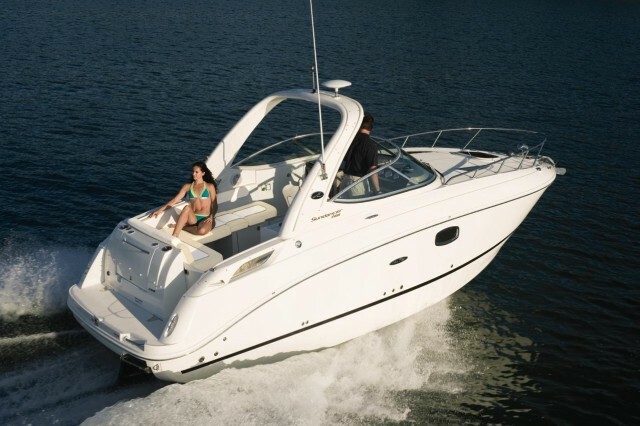 The Sea Ray 240 Sundeck comes in two different incarnations: stern drive and outboard models. I had a chance to run both on the Tennessee River, the stern-drive version with a Mercury 350 MAG hitched up to a Bravo III drive, and the Outboard model with a 300 horsepower Mercury Verado. First, for the commonalities. The two models share the same basic footprint, and as one might expect, have an identical extra-wide bow cockpit. That bow cockpit is what earns these boats the deckboat designation, and although it results in a net gain of seating space it does come at the usual price: a less-sporty look. Beyond that, I couldn't really identify a down-side when comparing the 240 with more common bowriders of this size. What about the reputation deckboat have always had for rougher, wetter rides? That’s a non-issue here, since the 240 is built on a 21-degree deadrise hull, just like their other sport boats. You prefer stern-drive propulsion? No problem, with the 240 Sundeck. 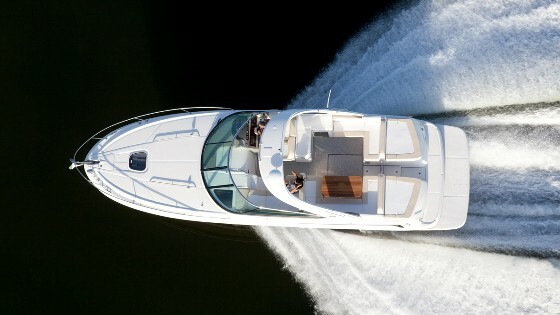 The extra room up front lets Sea Ray work in a number of cool features. Check out the fold-away arm rests, the over-sized anchor locker—which also houses a fold-out bow boarding ladder—and the freshwater shower. I love that Sea Ray put a freshwater shower up here for re-boarding after strolls on the beach, but on the boat I tested the hose draped into the anchor locker, exposed, just waiting for the fluke of a Danforth to catch it. Some sort of containment system would be a big improvement. At the dual consoles, I saw a lot to like. For starters, a peek into the helm console access door shows that Sea Ray not only found a good place to stow the cockpit table and support leg, they also put in a rack to secure it. Often, the table and base just get tossed inside, where they perpetually rattle and bang. When you peek inside to see the rack, also pull down the cover over the back of the console, and see how Sea Ray did their wiring. It was refreshing to see looms of well-organized wires secured in place, as opposed to the usual mess we see on so many boats. Want a peek inside the console first-hand? Check out this video to see why we liked the table rack and wiring. Another high point is the passenger’s side seat. The seat-back swings fore and aft so it can be converted between a forward-facing seat and an aft-facing lounge. Big deal, you say? Just about all passenger’s seats on runabouts do that these days? True, but how many of them do it with nothing but beefy stainless-steel hardware? There are no plastic knobbies, no extending wood bases, and no flimsy hinges. Thank you. The rest of the cockpit is exactly what you’d expect: tons of seating with stowage underneath, a ski locker in the sole, and a head compartment in the passenger’s side console. Keep moving aft, however, and you begin to discover what’s different about the 240 and the 240 Outboard. You might think that there’s a big gain in stowage space on the outboard version, since there’s no motor housed under the transom and aft seat. But you’d be wrong. In fact, the space where the engine lives in the stern drive version is mostly eaten up by mechanicals (pumps, batteries, etc) in the outboard version. 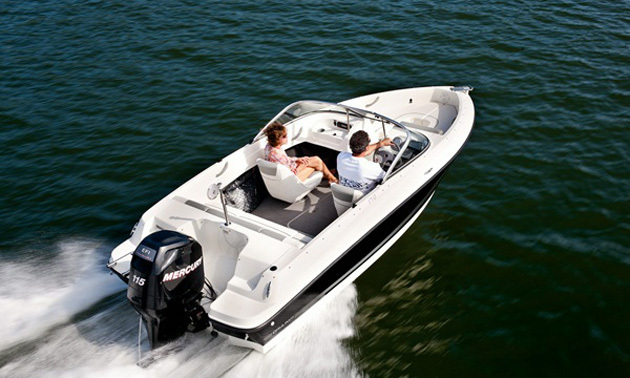 The biggest differences between the stern-drive and outboard versions of the 240 Sundeck become obvious at the transom. On top of that, you lose a lot of swim platform territory, as well as transom seating/sunning space. When it comes to sheer watersports/partying/sun-worshipping space, the sterndriver version wins by a long shot. So at first, I felt disappointed by how much less transom and swim platform space the outboard version offered. That is, I felt that way until I nailed the throttle on the outboard boat and watched the GPS climb up to 59.6-mph. My test boat had an arch and a top, mind you, and I had over a half tank of fuel. Shed a little weight and aerodynamic resistance, and there’s not one iota of doubt that this is a 60-mph-plus boat. At the transom, the stern-drive model clearly wins the space-race. That’s not to say the sterndrive version of the 240 is a slowpoke. With a top-end of 49.8-mph it most certainly has plenty of pep. But still, it’s hard to argue with an extra 10 mph. And on top of that, they’re pleasurable miles. Switching from the stern drive to the 300-hp Verado there’s a dramatic drop in both sound levels and vibrations, throughout the rpm range. True, the stern drive does a bit better in the fuel economy department at around a 35 MPH cruise, getting 3.4 mpg as opposed to 3.1, but the difference isn't so dramatic as to necessarily out-weigh these other benefits. In both cases the swim platform and step areas are finished with SeaDek, which feels great underfoot and stays grippy when wet. In both cases there’s also a monster stowage compartment in the port side of the transom which is excellent for wakeboards and tow toys, though it’s finished inside with polyboard, which doesn't look nearly as slick as a linered compartment and will be tougher to keep clean. One more difference between the outboard and sterndrive versions of the 240 Sundeck is weight capacity. 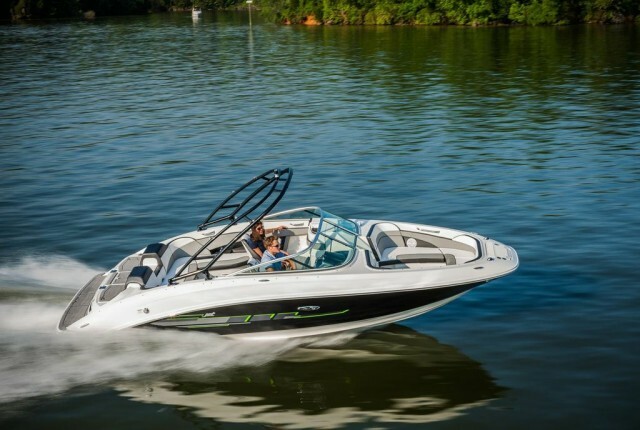 Since the sterndrive is notably heavier than the outboard version and has a different weight distribution it has less overall capacity, and the outboard 240 is rated to carry about 1,000-lbs. more. So, which will it be: sterndrive, or outboard? Both of these 240 Sundecks have their own advantages, and each is going to be in the running for most deckboat shoppers. But either way you choose, one thing is for sure—you’re checking out a boat with gobs of room, smart construction and design details, and zippy performance. Is Sea Ray still the red-hot builder that everyone else is trying to catch up to? Youbetcha. 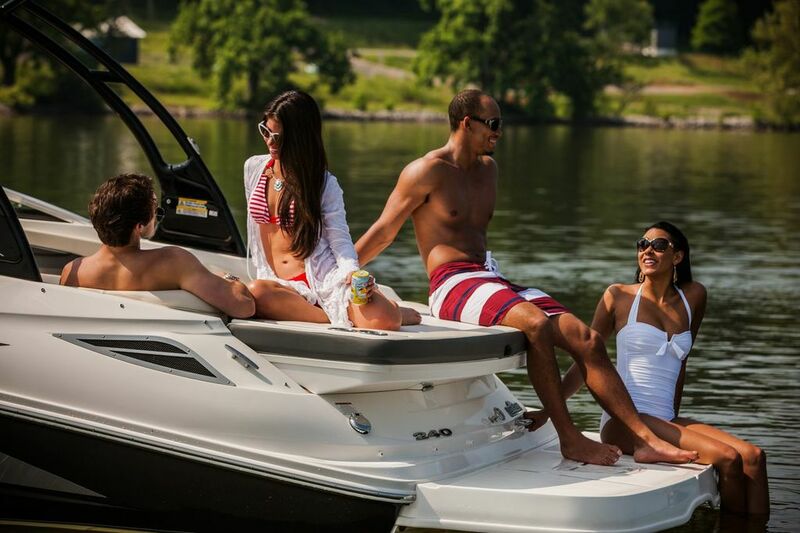 For more information, visit Sea Ray Boats. Power Single Mercury MAG 350/Bravo III stern drive. Power Single 300-hp Mercury Verado outboard.